Bonita Ely’s first exhibition was in London in 1972, but recognition of her artwork in Australia effectively started at the Mildura Sculpture Triennial of 1975, where she exhibited a close and complex examination of Mount Feathertop, a location in the Victorian Alpine region, that tested the tensions between observation and interpretation in visual representation. Her seminal installation, C20th Mythological Beasts: at Home with the Locust People, had its beginnings in New York where Bonita Ely lived from 1973 to 1975. Video was a component in the sculptural installation, commonplace now, but in 1975 this was a radical move. 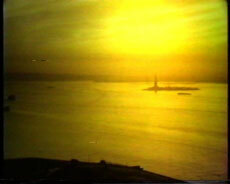 Sunset Video’s poignant sound and mesmerising images of working boats on the Hudson River, the Statue of Liberty, the shore line of New Jersey all shrouded in pollution, drew the viewer into the installation’s spatiality as an active participant rather than passive observer. Exhibited in institutions such as Chisenhale Gallery, London; Kunstlerhaus Bethanien, Berlin; Harbourfront, Toronto, and the 18th Street Arts Centre, Los Angeles, USA, Bonita Ely’s experimental artwork is in collections of prestigious international museums, such as the Museum of Modern Art, New York; the National Gallery of Australia, Canberra, and has been selected for significant contemporary art events such as Fieldwork, the opening of the Ian Potter Centre for Australian Art, Federation Square, Melbourne. She has produced three public sculptures for the City of Hue, Vietnam (1998, 2002, and 2006). Her performances of the 1970s and 1980s explored our relationships to the natural environment, other species, and each other, such as the cultural clash expressed in issues surrounding Aboriginal Land Rights in Jabiluka UO2 . Womanhood and pregnancy was explored in Breadline (1980). In Murray River Punch (1979), pollution of the Murray River was graphically described. In Dogwoman Communicates with the Younger Generation (1981),and Dogwoman Makes History (1983), our anthropomorphised fascination with another species was documented, alongside the gendered construction of History, using images of dogs in the art of Berlin museums, documented whilst artist in residence at Kunstlerhaus Bethanien, Berlin. Her most recent exhibition, World Wild Life Documentary at Performance Space, Sydney, is an installation of artwork she has produced over approximately thirty years that takes the viewer behind an observing, fascinated eagle eye, a curious mind, an obsessive collector and recorder of imagery and action. Works on paper accompany video as equivalent time based mediums. Bonita Ely has a diverse practice, her methodology based on the premise that a particular idea and context requires the deployment of particular mediums and disciplines. Her video practice began in 1975 with the production of Sunset Video. This artwork was a warning of the environmental issues that now are in full focus thirty years later. Her recent videos continue her practice as one of Australia’s important artists concerned with environmental, socio-political issues. Bonita Ely is Head of the Sculpture, Performance and Installation Department of the College of Fine Arts (COFA), the University of New South Wales, and Sydney where she is a founding member of the Environmental Research Institute for Art (ERIA).